Despite the outcome of Opening Day for the White Sox, there is something that I am proud of concerning Cleveland today. The first part of a trade between me and David from Tribe Cards, better known as Indians Baseball Cards. Always. David had received two White Sox cards from the 1950s in a stack of older cards that he acquired recently. He asked if I wanted these two cards. You bet! I was told to expect a package shortly. The package came on the perfect day, Opening Day! The White Sox and the Indians would be squaring off in Cleveland and I would be watching that on television and sorting through cards from an Indians fan in the Chicago south suburbs. I can't think of a better way to spend my time! Let's see what the mystery package contained. First of all, thank you! Second of all, thank you again! I wasn't expecting all of this. I recalled many fond memories with this selection of cards. I hadn't thought about that 1985 Fleer Star Sticker book in years! I had about 75 % of the stickers in the book. I could never find the rest. 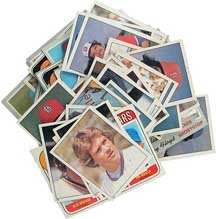 I was missing one or two stickers from the Seaver wind up series. I wonder if this was one of them. I will be ripping the pack of 18 Baseball Tattoos on A Pack A Day in the next few days. I wonder what 22 year old gum tastes like? It comes with gum! Tattoos and gum. Sounds like a rockin' good time at Archie & Jughead's Tattoo Parlor and Liquor Emporium. With Pete Rose on the pack cover, I'll bet it's good. Yeah, I know, that was bad. I will be searching for the perfect cards for a return trade. Thank you for all the good memories. I love the fifties cards, plus everything else! Where do I even begin with this game. Early on, this is a game that the Sox should have lost. Later on this is a game that the Sox should have won. The Indians played extremely well, but the umpires gave this win to the Indians. After Mark Buehrle gave up an uncharacteristic seven runs in the second inning, the Sox bullpen shut the Indians down as the Sox hitters chipped away at the Indians lead. Jim Thome hit two 2-run homers and the rest of the lineup hit well. The trouble came in the second inning as Orlando Cabrera's misplay of a double play ball led to 7 runs. The Sox had tied the score by the seventh inning. That's when the umpiring nightmare began. First up was Pierzynski's bouncer that took the first baseman off the bag. A.J. should have been safe, but he was called out. The umpire didn't have the foot coming off of the bag in his line of vision. Easy mistake. It happens. No big deal. The second mistake happened in the eighth inning. Joe Crede was called out at the plate, when the Indian catcher did not tag him. Joe adjusted his slide to avoid the tag. That call was more irritating, but still common. It all depends on perspective. The third, final, and costliest umpiring mistake occurred later in the eighth inning. Orlando Cabrera slid hard into second base to try to break up the double play. He was called on interference and instead of only the out at second base, there were two outs on that play. The thing is, earlier in the game, Casey Blake of the Indians had a similar slide, which was not called out. In both plays, the runner tagged the bag and slid past the bag to break up a double play. One was called for interference, one was not. These umpiring mistakes cost the White Sox the game. Jim Thome's two 2-run home runs. Nick Masset was dominant in 4 1/3 innings pitched in relief. Alexei Ramirez needs to be a little more patient at the plate, even though he does quickly adjust. Orlando Cabrera's misplay led to seven runs in the second inning. The White Sox have impressed me with their fire and intensity in Opening Day. They came back from a huge deficit and continued to try to win after the Indians took a 10-7 lead in the eighth inning. I felt like I was watching a game from 2005. Despite the outcome of today's game, I came away convinced that the White Sox will contend this year. SOLD OUT, said the sign even if you had cash. To watch those replays on the diamond screen. The home team's gonna make those cheering fans proud. Just need a day off to come out and play. Keeping a scorecard makes it more fun. Adults reach for foul balls while spilling their beers. Waiting for autographs of their favorite nine. So please have a heart, don't show them the gate. Like in "Field of Dreams", me thinks this is heaven? We follow them closely on baseball cards. Jim Morris at 35, the Oldest Rookie. The Rocket, The Cat, A-Rod, Moises Alou. 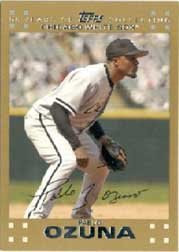 Olerud, The Big Hurt, bring back the twin bill. Mo Vaughn, Boomer, Jose Canseco. Barry gets them wet in McCovey Cove. McGwire goin’ yard, caused such a din! Big Mac — Tape Measure, synonymously! Who's rooting, parts of five decades do span. This ditty you're reading which IS all of mine. If you are from Baltimore, you root for the Birds! Baseball in Washington, by any means!!!" Very few make it, don’t you know. The crowning achievement is The World Series. There may be a sighting of Mr October. Peanuts and crackerjacks the vendors will sell. "A hot dog at the ballpark beats roast beef at the Ritz!" For those who were focused on the game itself, the Mets won 3 to 2. Not that the game really mattered. For all the build up and coverage, you'd think that someone would actually care about the game. That really wasn't the case and that's a real shame. I saw a game on ESPN, but I felt like I was in a history class. I did appreciate hearing about Jackie Robinson's first game in Spring Training. I also liked hearing about Martin Luther King Jr.'s life. The least that Joe Morgan and company could do was acknowledge that there was a game being played and do a little play by play. I figured out who was who, but there are a lot of casual fans who don't know the players by their numbers. The only time that Joe Morgan said anything about the game being played was the home run by Carlos Beltran and the home run that was reversed by Carlos Quentin. That's pretty much it. I watch games because I am interested in the play on the field, not because I want to hear about shooting a movie with Jackie Robinson. Yes, all of that information was interesting. I would gladly sit through any of that. I find those stories fascinating. I don't appreciate those stories in place of a game. Next year, ESPN would be better off broadcasting a History Channel special on the Civil Rights Movement. It makes absolutely no sense talking about that, and nothing else, over the images of a live nine inning game. The Civil Rights game was a great thing to see. I just wish I could have heard the game as well as seeing it. I could have invited my high school history teacher and put the game on mute for the same effect. Civil rights? Yes! Baseball? Yes! Civil Rights baseball game? Absolutely yes! Hardly a mention during the broadcast of the actual game being played that day? No. ESPN could have done so much more with this game. I heard more about the minor league team that usually plays in that park than about the Mets and White Sox. That's not the proper way to honor Jackie Robinson, Larry Doby and all the rest who sacrificed to play this game. I keep running into these cheap game-used card on eBay. I guess there are so many flooding the market now, that they don't seem special anymore. Will this devalue these cards for the regional and minor star player? Even Hall of Fame players seem to be picked up on the cheap lately. Unless a bidding war ensues, most game-used cards of players who retired in the last 30 years, can be won at or near the opening bid price. Yes, that's a real shame. These stars should be commanding a better value. On the other hand, it makes starting a collection fairly easy. I would imagine that would draw more novices to the hobby. The more the merrier I say. Just don't try driving the price up of something I'm bidding on. Then again, if somebody wants a card badly enough, they will end up paying for it. As for the card itself, it's nicely designed, if not flirting with being gaudy. I understand the uniform being underneath the C and the U, but what's the meaning behind the gold foil behind the T and the S? The silver foil surrounding the CUTS is blinding at times, but is textured in a beveled crosshatch. 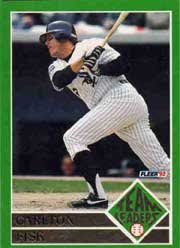 There's also a nice headshot of Harold from the lean years of the White Sox eighties experience. The 1987, 1988 and 1989 teams were some of the most horrid put together on the South Side of Chicago. Without those teams, the ressurgence in the early nineties could not have happened. If the White Sox did better in 1987, Robin Ventura may have gone to the Phillies. If the the club did better in 1988, Frank Thomas may have been a Cub. If they did better in 1989, Alex Fernandez would've been a Pirate. Even with those bad teams of the late eighties, Harold and a few others provided enough thrills to keep fans coming out to the park. I will always be grateful to Harold Baines and others by making those teams watchable. 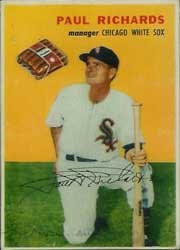 Now if only some company would come up with a John Cangelosi White Sox relic. I'd be in Heaven. Patricia and Lucy are back from Tucson and they came baring a gift. A photo of Todd Helton playing first base. But wait... who's that fan favorite first base coach? It's none other than White Sox legend, Harold Baines! You can read all about their Spring Training adventure here. You can read about my summary of the game here. It seems that Patricia and Lucy aren't the only ones with exhibition tales. Mario and Tatiana have their own adventure here. I would be jealous of everyone's good time, but in each case the heat was brutal. On second thought, that does sound better than the ice showers that have hit Chicago this week. I'm glad to hear that everyone had a great time at their respective games, despite the heat. I'm just happy that the season is opening up on next week here in the States. A live baseball game at 5 AM is not my idea of a good time. The White Sox are inching closer to the Midwest. Tonight, they played an exhibition game in Oklahoma City against the Rangers. The offense showed up again. This time, without errors by the defense counterpart. The Sox may actually be ready for the season. Paul Konerko hit another home run. Toby Hall and Jim Thome both drew two walks. Juan Uribe, Alexei Ramirez and Paul Konerko each got two hits. Even John Danks bounced back nicely. He didn't get the win, but he pitched well in five innings. The Sox won a challenging game that the Rangers brought. The Rangers put in a different relief pitcher in each inning. Mixing up pitchers sometimes confounds White Sox hitters. Luckily, there were a few innings where that didn't happen. Orlando Cabrera managed to get a hit and score a run. Does this mean he's ready? Brian Anderson was 0 for 4 at the plate, but has had a nice spring overall. John Danks had a shaky first inning, but recovered nicely. Mike MacDougal faced three batters and gave up three hits. I hope he can bounce back from this bad outing. Nick Swisher was 0 for 5 tonight. This was a good confidence booster for the Sox. They play the final spring exhibition game tomorrow in Memphis, Tennessee against the Mets. Jose Contreras against John Maine. I can't believe that the White Sox opening day is already on Monday. I can't wait! Luke Appling became the first shortstop to claim a batting crown when he hit .388 in the 1936 season. Luke was an extraordinary player. I was obsessed with him when I was in grade school. 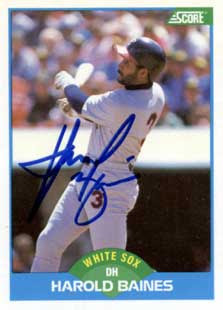 In fact, Luke was the first autographed photo that I purchased of a White Sox player. The photo was signed during the short period between a stroke and his death. I always see the same photos of Luke. So, when I see a different photo, I get very excited. The first time that I saw this card, I couldn't recall ever seeing the photo before. It gives a great closeup of his face, which is rarer than you might think. You can also see part of old Comiskey Park in the background. That just sold the card for me. If time travel were ever possible, I would travel back to 1936 and catch a game at Comiskey Park just to see Luke Appling play. He was the victim of a lot of bad White Sox teams. The Sox had a long road back to winning ways after the 1919 World Series scandal and World War II. Luke never got to a World Series and that's a real shame. I would imagine he would be more popular if he had some World Series heroics under his belt. My fellow bloggers and readers are awesome! I find surprises all the time. It could range from trades to gifts to awesome finds that just beg to be shared with the baseball card blogging community. The Writer's Journey is one of the blogs that I check out daily. I am currently working along side Jason on Baseball Legends. I am doing a bit of research right now and I hope to hear about a finalization on the writing format, so I can get past first drafts and notes. Anyway, I received a package in the mail yesterday from Jason. It was an unexpected package. I couldn't find any evidence of a forgotten trade (if that's the case, please nudge me), so I'm assuming this package is a gift. My mind is not completely focused on cards right now, so it could have easily slipped my mind. WOW! This was completely unexpected! The package is very appreciated! I can't say that there was much that I actually had. The only cards that I really had were the Fisk cards and the Baines cards, but that's fine by me. Any card of those two is welcome here! 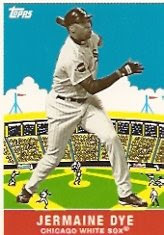 The one thing that I found really funny though, was the back of Lance Johnson's Topps Big card. According to the cartoons on the back, Lance Johnson and Kirby Puckett are both Caucasian players! That certainly news to me! In fact, Ivan Calderon was also had a white cartoon representative on the back of his card too. Very strange indeed. Thank you, Jason, for a nice trip down memory lane and a good laugh. 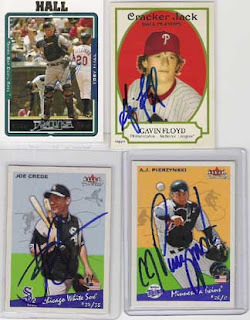 Last month, reader Mike G. asked for some advice on how to seek autographs through the mail. I shared the little bit of information that I knew with him and told him to let me know the results. Well, the results are in. Mike G. sent out 6 autograph requests to current White Sox players and he got four back! That's an excellent ratio. Hopefully the other two will find their way back to Mike G. as well. Toby Hall was kind enough to sign his 2005 Topps card. Gavin Floyd was nice enough to autograph his 2005 Cracker Jack card. Joe Crede and A.J. Pierzynski were gracious enough to sign their respective 2002 Fleer Tradition cards. Mike G. is still waiting on cards sent to Nick Swisher and Carlos Quentin. I hope those eventually come back to you, Mike. Even if they don't, that is an awesome collection that you have started. If you have any interest in obtaining autographs of your favorite players, check this FAQ first. Most players are accommodating. Make sure all the necessary postage is on the return envelope and write a short letter. Try to personalize the letter. Send one or two cards. Don't be greedy. Only send a card that you are willing to lose. Some cards just don't come back. Sometimes, no matter what your best intentions are, you still lose. I'm sure that has entered the minds of White Sox players lately. Sure, it's only Spring Training, but didn't Ozzie say that they were playing to win this spring? At least the hitting is starting to come around. If Nick Masset makes the team, I will be surprised. I know he is out of options, but that should not be a factor in his making the team if there is a better option. There is in Ehren Wassermann. I have a sneaking suspicion that Nick will make the team simply because the Sox do not want to lose him. If he brings performances like today's action, that would be a grave mistake. Konerko and Dye both homer. Scott Linebrink has a perfect inning. 4 out of the 8 Sox hits were from minor league players who won't be on the parent club anytime soon. Good for the future, but bad for the present. Matt Thornton's 2 runs in 1 2/3 innings. Nick Masset's starting pitching performance that allowed 6 runs. I'm glad that these are only Spring Training games. The Sox look ugly at times. It's a bit sad when a bunch of A and AA players can do more in a few innings than the regular team did all day. It's also nice to know that Oney Guillen knows how to hit into a double play. At least he's getting the experience of playing with the big boys. From seeing Mercedes one at-bat, I'm confident he will not be seeing a major league game anytime soon unless he fixes that swing. Let the slugging begin! And please help the pitchers. It seemed more like a game of tee-ball than a game played by major league players. A total of six home runs were launched in this game. Two by the Brewers and four by the Sox. Two of the four homers were hit by Jim Thome. A.J. Pierzynski had one and Alexei Ramirez hit a grand slam. Despite the Sox pitching staff being lit up, Linebrink and MacDougal were great. Mike MacDougal pitched a hitless inning. If he can translate that to a game that counts, he will go very far. The Sox may have held on for the win if Octavio Dotel didn't give up four runs. Only two were earned, so he had some help getting those runs across the plate. The bullpen is settling down, but not without a few last gasps of inconsistency. Four home runs by the Sox, including a grand slam with two outs by Alexei Ramirez. Mike MacDougal is getting it done in the bullpen. It's about time and a very welcome sight. Pablo Ozuna's 0 for 5 day. Gavin Floyd struggled during his five innings, but managed to have a good third inning. Another winnable, albeit ugly, game blown by the bullpen. Four errors by the Sox including another one by Toby Hall. No matter the outcome, this was an ugly game. It's nice to see most of the offense show up. It's not so nice to see most of the pitching implode. What ever Mike MacDougal is doing differently now, he needs to keep doing it. 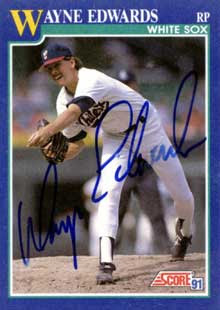 This is the nasty pitcher I remember in a Kansas City uniform. It seems that no one wants to talk about Jose Canseco's new book. Especially the players that are "named" in it or the people around those players. Most players are giving the famous "no comment" speech, with various tweaks. Alex Rodriguez included "absolutely" to spice up his no comment. Others have declined to say anything at all. Not a "no comment" comment to be found. You can always count on Ozzie Guillen to break the taboos and say something off the cuff. Right? Well, Ozzie does hold claim to one of the longest comments on this latest round of steroid talk. It also boasts the most information of any comment. "Magglio isn't a player on my team anymore," said Ozzie. Well, that about sums it up. All of that is true and is a clever way of saying no comment. 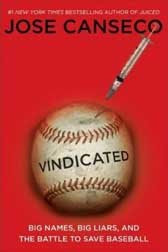 It appears that Jose Canseco's second book is being taken a little more seriously by baseball personnel. Why else would everyone be so quiet about it. People seem scared by the accusations brought about in this book. It should be interesting to see what happens after the release of this book. If a book can silence Ozzie Guillen, it stands to reason that it is powerful. There may be a few grains of truth in this book too. Back on February 2, 2008, I had a run in with "Darren Clarke" on eBay. Click the Darren Clarke label at the bottom of this post to read the previous entries of this saga. To make a long story short, I was harassed by someone claiming to be Darren Clarke. This person claimed that I was selling a fake autograph of him in my eBay store. I explained nicely to this person about pre-printed autographs on the Topps 52 cards, but apparently this person wasn't impressed with my knowledge of cards. I wrote this to The Topps Company on the morning after. 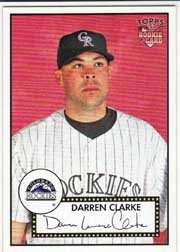 I have been contacted by Rockies pitcher Darren Clarke through my eBay store. He claims that I am selling a fake signature of his. 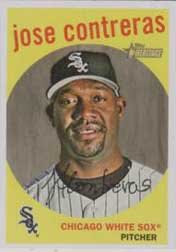 I am selling his 2007 Topps 52 card #157. He claims that the signature is not his and that he never signs his middle name. I explained back to him that it was a pre-printed signature and that it most likely came from a contract he signed. Looking at his blue autograph card from the Topps 52 set, the signatures look nothing alike. He claims the signature is not his on the base card and doesn't believe Topps would fake a signature. Can anyone explain where this signature came from? Today, at 11:42 AM Central time, I finally got a response from Topps about the incident. The following is from (MARVIN). Thank you for taking the time to contact the Topps Company. We truly apologize for the delay in responding to your email inquiry. A copy of your email was forwarded to our sports department at Topps. They will review the matter regarding the autograph that appears on the base card in the Topps Rookies 52 product. If you receive any further communications from Mr. Clarke regarding this matter, please have him or his agent/representative contact the Topps corporate office at 212-376-0300 to speak with a representative in our Sports Department. Again, I apologize for the delay in response. Do not hesitate to contact our Consumer Relations Team by phone at 1-800-489-9149 or by email at support@etopps.com if you have any other questions. A representative will be available to assist you between the hours of 8:30am-4:30pm (ET), Monday through Friday. Umm... yeah. I feel very confident in that response. I'm not jumping for joy or holding my breath for an answer. I basically got a form letter peppered with specific references to my query. I didn't even get an answer to my one question. Where did this signature come from? I will continue to keep everyone posted as this situation further develops. Finding cards in food packages is nothing new. Manufacturers were doing it before most of us were born. Some may think that Jimmy Dean or Ralston Purina or Hostess started this trend. Untrue! Tracing the origins of baseball cards back to its roots, we find that cards were issued as throwaway items as some incentive for choosing one brand over another. We can find that practice still going strong today. It's just evolved into something more elaborate. The first commercially mass-produced cards were for a sporting goods company called Peck & Snyder. They issued cards of team photos with an advertisement for their company on the back. They were handed out, for free, on street corners. In 1954, Wilson Franks distributed cards inside their packages of hot dogs. 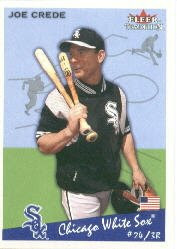 It was a 20 card set that featured 4 White Sox cards. The first thing that I noticed was the color of this set. It's eye-popping and eye-pleasing. The subjects look vibrant and lifelike. Whoever designed these cards definitely put their art degree to good use. This is one of the best looking sets of 1954. All 20 cards feature a package of Wilson Franks somewhere in the top half of the card. Some packages are bigger on certain cards. I'm not sure if that was intentional or some kind of cropping was done. Paul Richards looks like he's really pondering that package of Wilson Franks in his line of sight. Maybe that what was for dinner that night. The original cards are astronomically priced. There are beautiful reprint sets out there. I should pick up a reprint in place of the originals until I could afford them. You can see the entire virtual set here. As Spring Training winds down, the Sox seem to be getting closer to really gelling as a team. It also helps to have your ace on the mound in his final spring start. Mark Buehrle was on fire through six innings. He is ready for the season to begin. I do not envy any player that is playing the regular season right now. That means that they are overseas. This also means that both teams might have off years. It something about flying halfway around the world to play two games on a whirlwind tour that makes players tired. In that respect, I'm glad that the White Sox were out of the playoffs last year. That would be the ONLY reason. Mark Buehrle's strong performance over six innings with five strikeouts and one walk. Juan Uribe was 2 for 4 with an RBI and a run scored. 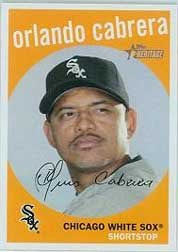 Orlando Cabrera was 0 for 4. Another stolen base on Toby Hall. I'm not sure how much was effected by Octavio Dotel's delivery and Willy Taveras' speed. This is the type of game I love to see. Not only was there a White Sox win, the hitting was timely and spread out. No errors were committed. The pitching was phenomenal. It really was a struggle to find two ugly examples. Give me more games like this one and I'll be very happy! Last year, there was an image uploading contest at Beckett.com. I'm not sure how the point system for that was decided upon. I thought it was 1 point per approved picture, but I ended up getting a few extra points for some reason. Anyway, that's not the point. The point would be that Beckett was giving away prizes for having points built up. I was going for the huge price guide book, but ended up with just enough for a Beckett Marketplace gift certificate for $25. Still, that's not too bad! Last week, I used the $25 gift certificate and went on a mini shopping spree picking up pesky singles. I picked up all the White Sox Father & Son cards and the Harold Baines draft pick card from the 1985 Topps set. The seller only had one of the Harold Baines, so the draft pick card will be going into my team set. Other cards included an Alex Fernandez 1995 SP card that I needed to complete the team set and a bunch of Carlton Fisk and Harold Baines singles. Some cards had images attached and some didn't. I tried to pick up as many cards around 1999 and 2000 of Harold as the two sellers had. Ironically, both sellers ended up refunding me money because of one card that was out of stock in each of the orders. Both were Fisk cards. 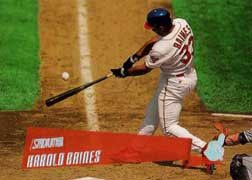 One of the cards that I couldn't find an image of was the 2000 Pacific Harold Baines. It turned out to be another Cleveland Indians card! I know, I'm slightly obsessed about his short time there. I hold the same fascination with any Orioles card of Reggie Jackson. Reggie just doesn't hold a buying interest for me. 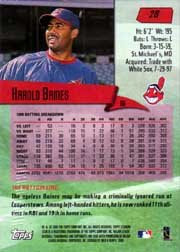 I'm very happy that I could find any Harold Baines cards featuring his Cleveland days. I didn't think there were any, but now I've found two. It just goes to show that there are undiscovered gems out there for any collector. Just when you think you know everything, you find that you know almost nothing. And knowing is half the battle. I woke up this morning not expecting much. Tracey went off to her work week and her weekday residence on Monday afternoon. Everything that I ordered or made a trade with came in the mail yesterday. Honestly, I wasn't looking forward to pounding the beat looking for employment. I was delaying that as much as I possibly could. I was eating a breakfast of three day old gnocchi and a Sprite Zero, which is the cornerstone of any nutritious breakfast, when my newspaper reading was interrupted by my barking dog, Tesla. She was named after Nikola Tesla, the inventor of AC current, the Tesla Coil and the Death Ray. Not the hair metal band! Tess, short for Tesla, was informing me that the mail carrier had stopped and delivered more bills and junk mail. Not too much in the mail today. The new Rolling Stone. Beckett wanting me to subscribe to their "sports" magazine. Bank statement. Pre-approval for a Home Depot credit card. A plain white envelope from Wax Heaven. This piqued my interest! I knew this package was coming, but I had relegated it to the back of my mind. I had other projects moved to the front, like moving my growing stack of White Sox cards into pages and into albums. Plus, a baseball related project that I'm not ready to reveal details about, yet. I opened up the envelope and under many centimeters of plastic and tape was the authentic autograph of Tatiana, the Heavenly Vixen, numbered 01/05! I was secretly hoping for one of the autograph cards, but truthfully, I would've been happy with any card. This card rocks! This made my day so much better! Thank you, Mario and Tatiana. This kind gesture perked me up today. This game was a duel of starting pitchers. Unfortunately, Jose Contreras gave up a few runs and lost the game because of that. His performance was outstanding though. I believe that Jose is ready for the season and that last year's poor performance was a fluke. His personal problems are mostly behind him and he should be ready to concentrate on baseball. Ichiro was a thorn in the Sox side in the game. He hit a single, a double, stole two bases, walked once and scored once. The bullpen held the Mariners scoreless though. That is a great sign! Once the bell rings next week, there are no do-overs. Everything will count. I think the Sox will be ready. Jose Contreras was dominating for the majority of his outing. Nick Swisher tripled and scored. Toby Hall had a single. His average is now at .077. The Sox kept giving up doubles to the Mariners. No Sox player walked today. Thome and Anderson combined to go 0 for 7 with 4 strikeouts. The anemic hitting needs to come around. The Sox can't expect to win games when the team only gets 7 hits, 1 run and no walks. Jarrod Washburn threw 7 shutout innings, so the Sox can't be blamed entirely when they run up against a great pitching performance. This trade has been about a month in the making. Slightly less, I believe. To everyone who has sent an extensive trade request (or even a small one), I am working my way down the list. I apologize for the delay. I've sent off a list to Nicole at Olagato House a few days ago, that was long overdue. Let's just say that the more cards involved, the longer it takes to go through the boxes. Rest assured, I haven't forgotten about any of them. Now that the obligatory apology is out of the way, on to the trade. Cliff has only had Capewood's Collections for two months, but already it has carved out a nice niche. He is a Phillies fan and an Astros fan, as a result from moving from the Philadelphia area to the Houston area. Cliff is always friendly and always has a kind word or comment. He's definitely on my "Nice Blogger" list! After e-mailing lists back and forth, we settles upon a trade. I would send off a bunch of Astros and Phillies cards and Cliff would send a bunch of White Sox cards. It's a win-win situation. We tried to pick out stuff that was close in book value on both ends. Well, I don't really work that way most of the time. We decided on close enough, but I threw in a few extra cards for good measure. Honestly, all these trades are starting to run together. The list I gave Cliff was pared down and revised before agreeing to the trade. All I remember is that a lot of Phillies and Astros cards found a new loving home. The thing that surprised me the most about this trade? 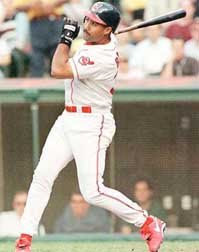 How many cards that Mike Cameron and Mario Valdez have in 1998. Thank you, Cliff! I hope you enjoy your cards as much as I enjoy mine! 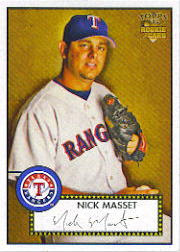 This is the most recent card of Nick Masset that I could find on short notice. 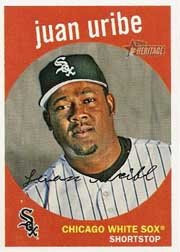 I suppose if I really wanted to I could track down the image to his 2007 card with the White Sox. I suppose I could look through my 2007 Upper Deck team set to see if I have that card. I'm missing a few from the second series and I think Nick may be one of those. Truthfully, I'm too lazy to look after a long Easter day. So, you'll get a Rangers card of him. The Sox started things off right on the first pitch of the ball game. Jerry Owens hit a triple, which makes the outfield situation tougher with each hit that Jerry gets. Brian Anderson has had the edge, but if Jerry Owens emerges victorious, it's because he can leadoff, get on base and run. Nick Masset pitched a scoreless inning, further complicating the final bullpen spot decision. Quentin and Anderson both went yard. Alexei Ramirez can't hit anything but fastballs. Another tough game that they could not win. The Sox seem to be doing just enough not to win. If they have any shot at winning more than 72 games this year, they need to win these games. At least the bullpen kept them in the game. It's nice to see Carlos Quentin finally come around with the bat after a minor setback earlier in the spring. The Sox are showing some signs of life after all. On a back and forth game with the Cubs, they manage a tie. There were very positive results with some batters and others look like they are searching for home plate. Most players are at least getting quality at-bats out of Spring Training, even if the end result isn't pretty. Six batters went at least .500 at the plate for the day. The rest went .000 for the day. That's not exactly setting the world on fire with that ratio. There needs to be more consistency at the plate. The hits need to be spread out among the players. Three players can get all the hits, but if they are spread out throughout the lineup, the team isn't going to score many runs. Uribe, Cabrera, Crede, Quentin, Anderson and Phillips all batted at least .500 for the day. Octavio Dotel threw a perfect inning that included two strikeouts. Javier Vazquez gave up 4 runs. Nepotism favors Oney Guillen as a pinch runner. He scored a run, but why is he playing on the team? Jermaine Dye dropped a ball in the sun in the late innings that caused the game to be tied. Logan and Omogrosso both blew saves in this game. This was an all or nothing game. There was no middle ground. This needs to change quick! The season fast approaches and this type of game is not winnable. The Sox had ample opportunities to win this game. They are lucky that they got a tie. The reason I ask, is that I don't have this card. It's a variation on the more common running card of Josh Fields. If anyone has this card and is willing to trade, please contact me with your demands. This was a card found only in Wal-Mart packs in 2007. I'm assuming that this was seeded into Series 1 packs, since the card number is 292. Frankly, I'm a bit surprised that I don't have it. I certainly bought enough packs of Topps from Wal-Mart last year. Especially Series 1 packs and blasters. When I got back into collecting full time last year, I went nuts buying packs at places like Wal-Mart, Target and K-Mart before I found local shops. I still picked up packs at the retail stores after I discovered two shops in my area. I certainly hope that some kind soul will reach out for a trade. I'll keep my fingers crossed. Well, we all needed it. Mario had the vision to create it. So, without any further ado, the Baseball Card Blog Directory. Hopefully, this way, nobody should ever feel slighted again. This is an excellent way to keep track of everything that is out there. Heaven knows that I try to keep up with everything, but some things still escape me. It was about time something like this came along. It just took Mario's genius to make, what should have been obvious, happen. Now that the links are all in one place, I can't wait to watch our community grow! Seeing the site in action, reminds me of the joy of this scene. This has been a work in progress since its release. I think I have found all the variations and insert cards. I did not include advertising panels or buy back cards. Everything else is pretty much fair game. The thing that surprised me the most is that there are no White Sox chrome cards. If there are any, I haven't found any evidence of them. There are no wild variations like the Johan Santana and John Smoltz cards. There is only one short print in the base set. That would be Jose Contreras. The White Sox have 15 cards in the regular set. There are also 4 different cards with the black back variation. The complete regular set with short print cards is numbered to 500. There are 110 of those cards with black back variations. Surprisingly, the White Sox seem to have a fairly strong checklist. I'm not certain why Jerry Owens has two cards. The 1959 version of the set lists Jim Davenport of the Giants as card number 198 and Luis Aparicio of the White Sox as card number 310. So, I'm guessing it's not an oddity from the 1959 set. I really should mention how much I love these cards. I swore that I wouldn't collect sets anymore, but this set is begging to be collected. I have decided to collect the whole shebang. This will probably be the last post directed twoards this 2008 Heritage set. At least for awhile. Everyone seems to be doing posts on this set right now. I wanted to wait on this set review until I was positive on the checklist. I'm glad I waited. It was a pretty decent pitching match today. Gavin Floyd against Barry Zito. For those of you who think Zito is overrated, he only allowed 2 hits in 5 2/3 innings and got himself a hit while batting. Gavin did very well. He allowed two runs in the first inning and nothing else in his 6 innings of work. He even got out of a couple of jams without a scratch. Every performance like that builds confidence for the season. The Sox only managed 6 hits, so Gavin would be the tough luck pitcher who luckily gets a no decision. The Sox bats needs to show up more often. It doesn't help when half of the hits for the Sox came in the ninth inning. Gavin Floyd looks better with each outing. It seems like it was a good decision to throw him in the starting rotation instead of trading more away for veteran starting pitching. Juan Uribe pinch hits and gets a double. Only six hits in the game. No player had multiple hits. Gavin Floyd looks good at the plate, but ultimately strikes out. Maybe the switch to the American League was a good thing. The catcher's position went 0 for 5 between Pierzynski and Hall. Hall's spring average is at .000. Childers blew the game in the ninth, when the Sox had the game won. The comeback in the ninth was nice to see. If Jenks had been out there, the game would be in the bag. Josh Fields had a spectacular throw to first base, on a tough play, to get out a speedy Velez. I'm shocked Paul Phillips caught that throw. He can handle first base very well. That was a bullet of a throw. The bullpen, save for Childers, looked great this game. I hope the good bullpen shows up to most games. Linebrink and Wassermann looked great in their outings. One of the nice things about running a successful blog is that I tend to have spies everywhere. Many extra sets of eyes, if you will. In the past few days this has even turned up an elusive Cleveland Indians card of Harold Baines, which I purchased on Beckett Marketplace last night with the gift certificate I won in the Beckett image uploading contest a few months back. The following occurred at a local card shop, in full view of one on my readers named Steve. I'll let him explain it. "Well, I don't think I'll be going to Baseball Dreams and Memories anymore. The guy's a real jerk. A group of kids were in the store admiring the cards (around 9-10 yrs. old) and he goes to them in a real snippy voice 'Don't you guys have anything better to do than just HANG around?' They said nothing and he said 'Oh, you have nothing to say' and laughed. Needless to say the kids were scared and left. I thought I would send this to someone who shops there; then I'd feel like I was doing something about it." This is another reason why card shops are dying out. I find this absolutely unacceptable behavior. Even if you're having the worst day, you don't scare browsing kids out of your store. They tend to be a store's best customers in a few years. It's positive experiences that will keep them coming back to spend money. Plus, kids that age tend to con their parents into spending money on their interests. I have a feeling that store just lost some decent business. You may remember me talking about this store before, even though I didn't mention it by name. This would be the store with the great selection of individual packs and the hit or miss service. This time they definitely missed. The problem with this scenario is that I only know of two card shops in my area. So, unless I find a few more shops close by, I may be forced to shop there for some items. Can anyone suggest any great card shops on the South Side of Chicago? I already have a great atmosphere shop in RBI Sports Cards in Burbank, Illinois. It just doesn't have the selection that I'd like sometimes. I've talked about this shop too, although never by name. The owner, Tony, is a wonderful guy. He loves to talk shop and the atmosphere is outstanding! I would prefer to go there for all my pack needs, but the higher end stuff only sells by the box. I've had pleasant experiences at Baseball Dreams & Memories, but I think that is because I am in my thirties. I've had just as many bad experiences at that shop. I can remember a time where I was charged for four packs of Allen & Ginter and only found three in my paper bag. It was difficult to tell until I got home because I purchased many other items, including different packs. I definitely need to find a replacement shop! There are a few items that I am almost forced to go in there for. I really don't want to go into this shop again. I've been on the fence for months, but this was the last straw. If anyone has info on good card shops, please leave the info in the comments section. If we get enough, I will do a posting listing the card shops after my personal visit. I think reader Steve summed up the card shop experience best in his follow up e-mail. "As fleeting of an industry as baseball cards are you'd think an owner would appreciate any sort of customers. It was an outrage." I couldn't agree with you more Steve. Thanks for the heads up about this incident. Now, I leave it up to the local area readers to let everyone know about the good card shops around here. Out of area readers can join in too, if they know of a great online shop. We need to get a listing done pronto! Horror stories or great experiences are welcome in the comments as well. OK, you may be wondering what qualifies this card to be in the card spotlight. You'd be right to be skeptical. First of all, it is the only card that I know to feature, in big letters, the correct spelling of my fiancée's first name. His first name is close enough to mine that it's a little eerie. If he has a brother named Steve who ends up playing in the majors, he would be my new favorite player. Anyone named Steve Tracey, who makes it to the majors, has an instant fan. As it is, the closest I will ever have of my own name being in the majors is Esteban German. Not exactly a match, but again, close enough. It was enough to make me notice the similarities, but only after encountering the name a few times. It didn't dawn on me right away. Secondly, Sean Tracey is the only player that Ozzie Guillen has made cry. At least that the public knows about. While that's nothing to make fun of, I kind of admire Sean for doing that. It shows that players are human beings. They have feelings and they are not machines of the hitting or pitching variety. I think it shows a bit of heart to expose yourself in that way, in a very public game. As for the picture on the card, it looks like the photographer told Sean to stand outside the stadium and pose. It's a different take on the brick wall background picture. I like it. I can't help noticing that the jersey is a prop though. There's no name and no number on the back. Even the players who don't have a name on the back of the uniform in Spring Training get numbers. If the building escaped you as a clue to this photos staging, then the lack of a uniform number would be the determining factor. Sean didn't last too much longer after the Ozzie incident. He is now in the Baltimore Orioles organization. Or as I like to call it, White Sox East. I hope he gets another shot at the majors. He has decent stuff. Has Juan Uribe Been Placed On Waivers? There's a reason why I haven't commented on this situation yet. I just don't know which story to believe. The rumors have him placed on waivers. One story has Juan pulled off of waivers. Another story has Juan never placed there. I'm confused. Making matters worse, the Sox can't comment on the situation. This always leads to wild speculation. So, is he or isn't he? I guess we'll find out in the next few days. South Side Sox has a good report on the whole affair. I've also heard that there was no interest in him for a trade, so he was placed on waivers. This led to at least one team expressing a lot of interest. That response led to the White Sox pulling Uribe from waivers to hash out a trade with the team(s) of interest. If this sounds confusing, it is. Without any confirmation, it's all speculation right now. Does this mean that Juan Uribe is on his way out? Does this mean Alexei Ramirez is the second baseman? Or does it mean that Brian Roberts is headed to the White Sox in a trade? Your guess is as good as mine. Brian Roberts would solve the leadoff spot and put a solid second baseman in the lineup. I have a feeling that the Sox think that Alexei Ramirez can fill that role nicely. I would hate to see that Alexei is a Spring Training player that cools off when he gets to the regular season. Past examples of this type of player include Juan Uribe and Brian Anderson. Whatever the outcome, it should be an interesting few days watching this pan out. It could turn into nothing or it could be the move that puts the White Sox over the top. We'll find out the results at the end of the season. The White Sox and Dodgers now have one thing in common. Their respective records for the spring are both at 9-13-2. Mark Buehrle showed a comfort usually reserved for the season, but so did the Dodgers starting pitcher Brad Penny. Buehrle only gave up one run in five innings. 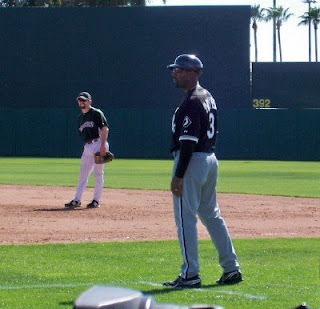 There were flashes of brilliance from Paul Konerko, Juan Uribe and Alexei Ramirez at the plate. Boone Logan and Bobby Jenks nailed down the late innings, but by that point it was too late. Mike MacDougal and Octavio Dotel blew the game wide open when the Dodgers used them for batting practice. Octavio Dotel was the bulk of the bullpen's woes. Paul Konerko was 2 for 4. Buehrle only allowed his one solo homer per game average. He was dominant the rest of the rest of his five innings. Mike MacDougal's 2 earned runs. Octavio Dotel's five earned runs in 1/3 inning. 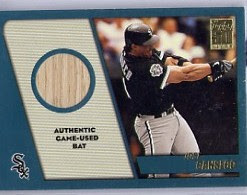 Joe Crede continues to struggle at the plate. There were many good things about this game despite the outcome. 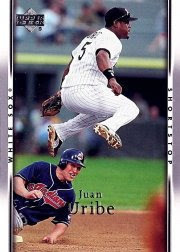 Juan Uribe had a stolen base, which is unusual for the husky player. The hitters are starting to get in a groove. 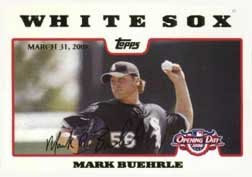 Mark Buehrle was outstanding. So were Boone Logan and Bobby Jenks. It seems like another game of all or nothing. There has to be a happy medium found soon. There was a St. Patrick's Day contest over at Cardboard Junkie. There were 20 cards that had to be identified to win a prize. I looked the cards over and determined it was too easy, so I figured I'd let someone else win. But when no one got all 20 by the next day, I decided to end the contest. There were some tricky ones in there. The card that kept tripping everyone up was the 1922 E120 American Caramel. This was very familiar to me, as I did a blog on a set of caramel cards from the same time period. The green tint was the key to identifying the card. All the caramel cards from the twenties have a similar design. The winnings came in the mail today. I was expecting the Fisk since dayf teased it on a later post. He e-mailed me to expect a bonus with the Fisk card. The green Fisk was good enough. I didn't have it, so I was very happy. Anything else would be gravy. I love the bonus cards! I know I've said this before, but dayf always throws in the coolest stuff. Thank you for the cool contest winnings! They are all very appreciated. I have to give a big thanks to Cliff from Capewood's Collections for cluing me in to this card of Harold Baines on the Indians. I will have to keep my eyes peeled for this card. Knowing it exists is over half the battle. Every 2000 card of Harold Baines that I have come across features him in an Orioles uniform. I suppose since Harold signed back with the Orioles in December 1999, it was just easier to use older photos of Harold already in a Baltimore uniform, to stay current. My favorite part about this card is the little blurb on the back. "The ageless Baines may be making a criminally ignored run at Cooperstown." Isn't that the truth. He has enough votes to stay on the ballot each year, but if his numbers don't start improving, it may be a lost cause. I certainly hope that's not the case, but it looks that way. Thanks again to Cliff for supplying me with these images of the card. It's always nice to know there are extra pairs of eyes out there making it a little easier on me. I was skeptical, at first, about the new company that took over the ad campaign for the White Sox. I was surprised to find the two newest commercials very entertaining and fun. I suppose I should applaud them for finding a delivery guy that reminds me of ex-Sox relief pitcher Wayne Edwards. The "fan" reminds me of the "Get Up" guy from the 2000 season. He would always stand up, hold his "Get Up" sign and whip the crowd into a frenzy. He was always featured on camera when he did that. I hear that there will be more commercials making their debut shortly. I hope they are as entertaining as these first two. They aren't much, but they do hit the right notes. Sometimes that's more important than a flashy spot with all the bells and whistles. Here are YouTube videos of the first two spots. Enjoy! Another new blog has appeared. This time about the cards of the New York Mets. I suppose it's about time. 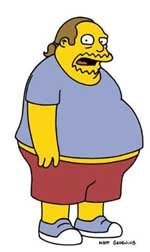 There seems to be a flurry of Braves fans with card blogs. So far the postings have been about Nolan Ryan and Jim Fregosi. 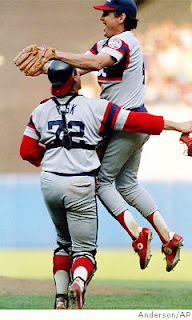 I was going to go with a card of Jim Fregosi, but while searching for Jose Canseco White Sox card images for the last post, I ran across this photo of Tom Seaver and Carlton Fisk. I don't get why I would come across this photo while searching for Jose Canseco, but life is strange. Jim Fregosi wasn't a great mananger for the White Sox, so I went with Tom Seaver. He was a part of the 1969 Amizing Mets and he won his 300th game for the White Sox. It seemed more appropriate. I don't know much info about the blogger of this site, but they go by the name NYBBNUT. It looks good so far. I really enjoyed the Nolan Ryan card from the first post. It's a card that I don't ever recall seeing. I look forward to seeing interesting cards about the Mets. The blogging community is abuzz with the news from Florida last night. Mario of Wax Heaven finally met his idol, Jose Canseco. After watching Jose's brother Ozzie play softball a few times, the unthinkable happened. Jose showed up to the game and played. Jose went 2 for 5 with an RBI double, according to Mario. I can only hope that if I ever meet any of my childhood heroes, it can be under circumstances this cool. Jose even offered to take a picture. Maybe he reads Wax Heaven secretly. Congratulations Mario! From the way you describe it, the meeting was everything you hoped it would be. I honestly don't know how I would react if I ever met Harold Baines or Carlton Fisk, not to mention the other heroes of my childhood. People sometimes have a funny way of reacting to people that they admire. Would I be shy meeting Bobby Thigpen? Would I ask endless questions about baseball and music if I met Jack McDowell? Would I get nervous around John Cangelosi? I really don't know. I'd like to think that my tongue wouldn't be tied. I'd like to think that I could have a normal conversation with them. They are all just human beings, after all. Why should it be any different than meeting any other person? The truth is, it shouldn't be. These ballplayers are all normal people. They have just done something with their lives that garners a lot of attention. Some would say obsessive attention. Then again, it reaches nothing like the coverage of people like Britney Spears or Brad Pitt. This was a typical Spring Training game. It was back and forth, high scoring and ended in a tie. There were heroes and goats. It was the kind of game that draws you into it, but would make you yell at the players if it were played during the season. Nick Massett got lit up, but the Sox offense showed up early. Alexei Ramirez hit his first home run to lead things off in the bottom of the first. 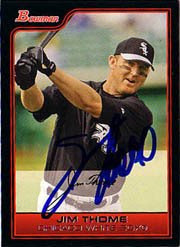 Jim Thome followed suit with his own solo home run two batters later. Everyone on the Sox gave up hits and/or runs except for Matt Thornton. 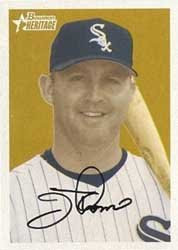 Jim Thome's two home runs and 6 RBI. Brian Anderson and Alexei Ramirez are on fire! Nick Massett's pitching. 6 runs in 3 innings. Paul Konerko's 0 for 4 day. Josh Fields being taken out of the game after getting hit by a pitch in his first at-bat. Toby Hall's ability to not get the runners out. If one good thing can be taken from this game, it's the fact that the Sox came on strong in the late innings. That was a key to their 2005 season. They struck early and they struck late. They also had a bullpen that could hold the lead. I'm hoping that this style of play returns this season. Without a bullpen and without baserunners, the Sox tend to go station to station waiting for the big home run which rarely comes. OK, this should have been posted yesterday, but I always have to make things difficult. I'll get to that later. Yesterday, Rich, who posts at Bad Wax forums and won one of the Heritage contests I ran, started a baseball card blog called Out Of The Mill. There's a nice story about why the site is called that in the Welcome post. So far, Rich has posted videos depicting parts of box breaks. He's off to a fantastic start. I can't wait to see how this blog grows. Now, on to the difficulties. I noticed the list of players, sets and teams that Rich collects. One of the things he is collecting is the Cleveland Indians. I try to find images that mean something to the blogger that I am promoting and something that has a White Sox connection. It doesn't always happen, but I try. I could've should've used an image of Jim Thome or one of the Alomars. Even Joel Skinner would have worked. I wanted to be different and use Harold Baines. It sounds simple, but i assure you, it is not. Harold was only on the Indians for a few months in 1999. He went to the playoffs with the Indians. I figured there has to be an image of Harold in an Indians uniform. He did have a great home run in the second game of the ALDS in 1999. This was one of the most difficult tasks I have ever taken on. I had a better shot at finding Jimmy Hoffa. Keep in mind that I've been trying to find an image of Harold as an Indian for years. I had one image, around November 1999, but my computer had "issues" and I lost the image. It was an image of Harold sliding into a base wearing an Indians uniform. Harold does not have any cards (to my knowledge) featuring him as an Indian. I finally found an image two minutes before I started this post. I literally felt like I hit the lottery. So, to Rich and my other fellow bloggers who are Indians fans, please enjoy the fruits of my endless search. Photographic evidence that Harold Baines was on the Indians. Rich, good luck with your blog and welcome to the community. I would have to say, without question, the most successful player wearing number 62 would be Ehren Wassermann. The problem with this selection is that he only wore number 62 in 2007. In 2008, he switched his number to 43. Jack Egbert now wears number 62 in the Spring Training games. If Jack Egbert keeps this number and keeps up with his projections, he should easily take this number from Ehren when he is called up. Until then, it's all Ehren Wassermann. Ehren is one of those types of players that I love. There isn't any direct comparison to his pitching style. The easiest comparison would be a submariner, but that doesn't tell the entire story. His delivery is similar to a sidearm pitcher, but there's something different about Ehren. I just can't put my finger on it. He made his debut on July 20, 2007 at Fenway Park. Ehren faced two batters and retired them both. 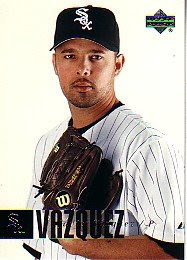 At the end of the 2007 season, he was the only lock for the bullpen besides Bobby Jenks. Ehren is still pitching effectively, but there may not be a place for him in the bullpen as the season starts. Ehren is more of a specialist pitcher. The Sox are looking for a long man to complete the roster. Ehren may not break with the team to open the season, but his numbers are impressive enough to bring him up at any moment. He had a 2.74 ERA in 2007, with a 1-1 record. He also had 14 strikeouts in 23 innings. He may not get the recognition that he should, but Ehren is one of the key guys in the Sox bullpen. Everyone has a role and Ehren excels at his specialist role. The Sox went crazy after the 2007 season and signed a good amount of high priced talent to fix the ailing bullpen. Ehren was one of the few components that wasn't broken last year. It looks like one of the regular lineups was in place for the majority of the game today. The results were less than spectacular. No runs. No errors. 8 hits. John Danks did not help his cause with 4 earned runs, but the 7 strikouts were impressive. 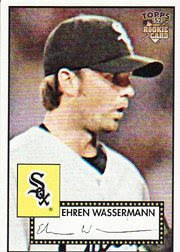 Ehren Wassermann may have pitched himself out of long man contention by giving up the earned run. He didn't do poorly, just not well enough. Tomo Ohka, on the other hand, may have shoehorned his way into the competition with two scoreless innings. The hits were there, but the Sox couldn't seem to bunch them together. Only four out of the 10 different batters went hitless. Joe Crede went 2 for 4 raising his average to .135. Juan Uribe continues to surprise people this spring. The Sox ground into 5 double plays. Owens and Thome both struck out twice. The Sox had 21 opportunities to move the runner along that failed miserably. The Sox had 5 players in the starting lineup with an average of .238 or worse. The Sox are giving the fans fits this spring. Either everything goes their way or nothing does. There has to be a middle ground that pops up soon. The good thing is that the hits are coming. The bad thing is they come alone. The Sox definitely needs to work on moving the runner along. The White Sox finally tied a game. Maybe it was because they didn't wear their traditional green uniforms on St. Patrick's Day. The Brewers got to wear their green caps, but the Sox were sans green this year. That was a bit dissapointing. I love the green uniforms on St. Patrick's Day. I always thought it was cool that the Sox would auction off the uniforms for charity afterwards. Javier Vazquez had another strong outing. Out of the four runs that crossed the plate, only one was earned. The bullpen was outstanding. They kept the Brewers scoreless in relief through the tenth inning. Javier Vazquez was decent on the mound and a demon at the plate! Pablo Ozuna was 2 for 5. 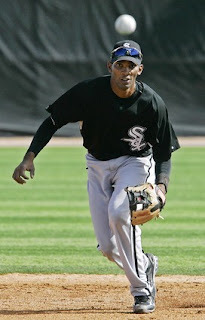 Alexei Ramirez was caught stealing. It's bound to happen from time to time. Brian Anderson's hot hitting spring cooled for this game. He went 0 for 4. Josh Fields' error led to three runs. This was definitely a winnable game, but anything can happen in baseball. This is proven game after game. The pitching staff was solid. The hitting was a little sketchy, but still there. I'm still bummed that there wasn't a stitch of green to be found on the Sox. If you haven't guessed, it's my favorite color. I'm always in a good mood when the Sox wear it. I ran across this posting today about St. Harold Baines Day. I thought it was fun and wanted to share with the rest of the class. It's funny and informative at the same time. The author suspects Harold to be part ninja. It may surprise you to know that Harold went 1 for 4 with 2 RBIs on the day he was born. Could Harold be the only man to collect more hits than words spoken in his career? I know it was part of the joke, but it might actually be true. Harold did an interview on a White Sox Spring Training broadcast this year. It was the most I've ever heard him speak. I had actually forgotten what his voice sounded like. This is truly a man of few words. He let his bat do the speaking for him in his career. Now that he's a coach, I'm sure he must have to speak slightly more often than when he was a player. A mute coach isn't really effective. The White Sox usually wear green on St. Patrick's Day. This year, they didn't. I don't know if that was because they were at the Brewers training facility or what. The Brewers got to wear green caps though. I remember each Spring Training that the Sox would wear their green uniforms and then auction them off for charity. But anyone can show a Sox player in a green uniform. Who can show a picture of a White Sox green coin? Me, that's who. It isn't mine, but I was able to find an example of one online. 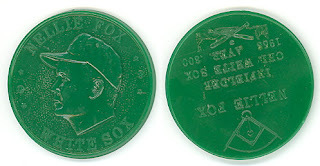 This is a green variation of a 1959 Armour Baseball Coin of Nellie Fox. I don't know much about these coins, but I do know that I love the color of this plastic coin. I figured this would be the perfect item to showcase today. I've had enough Diamondbacks and Rockies games against the White Sox to last all season. I'm very happy that they are in the National League and won't be playing the White Sox very much during the season. The Sox play the Rockies in Chicago for one three game series. That's it. I like both teams, but it seems like the Sox are only playing the Rockies and Diamondbacks lately. Variety is the spice of life, you know. Oh well, it's only Spring Training. The Sox lost another close game. I'd rather see the Sox lose close game, than get blown out. It shows that they can hang in there the entire game. I don't really know of anyone that likes losing by 12 runs, but I imagine it might be therapeutic in a strange way. Close games get the players ready for the season though. A.J. 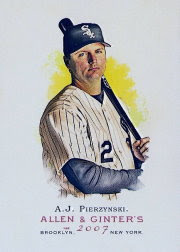 Pierzynski went 3 for 5. Tomo Ohka had two scoreless innings. Gavin Floyd gave up 5 runs. Although, only 4 were earned. Jerry Owens may have been 3 for 5 at the plate, but he committed a throwing error. Joe Crede was 0 for 5. Andy Sisco gave up the winning run. Joe Crede needs to find his swing. If his stock continues to plummet, there won't be any trades happening. He's getting better defensively, but his batting average is at .091. Jermaine Dye had a home run. He looks like he's returning to 2005 form. It's nice to see A.J. start to hit. This was a very close game and it could've gone either way. There will be some tough decisions coming up shortly. The bullpen will probably come down to the wire. I'm usually not one to pass up on a trade, if I can complete it. I am currently working on a few trades. I will be contacting a few people in the next few days about trades that they have requested. I just don't have enough time in the day to constantly track down cards. I wish I did though! When multiple cards are involved, it can be a lengthy process. There have been a handful of requests in the past week or so that involved the e-mailing of massive lists to me. For those of you waiting, I apoligize for the delay. I haven't forgotten, real life unfortunately intrudes on massive cards trades. The huge lot trades can be worth the extra work though! The most instantly gratifying trade is the one or two cards for one or two cards. Usually, it doesn't take a lot of time and it can be completed in less than five minutes. It usually goes like this. "I have such and such card to trade. I'm looking for this card for it. If not, any of these cards will do in its place." Those trades are so simple, I can usually do them in my sleep. Sometimes, they can be tricky. Take the latest trade with Joey from Squeeze Play Cards. He had gotten an autographed redemption card of John Danks, a former Rangers prospect and Austin, Texas native, who is now in the starting rotation for the White Sox. At the bottom of his post about it, Joey mentioned that it was up for trade if I wanted it. Um, yeah, I want it! Joey's trading request was very loose and open to a wide array of possibilities. All he wanted was an autograph or relic card of anyone in a Rangers uniform or some Ivan Rodriguez insert cards. That seemed simple enough, right? It should've been, but it wasn't. I thought I had the perfect card to trade. It stuck out in my mind. Autographed or relic Rangers cards are a rare commodity in my house. I tend not to get too many. The card I had in mind was a 2007 Bowman Signs Of The Future autographed card of Matt Merricks. He was in a Texas Rangers uniform, so I thought that would be perfect! Then the drama happened. There isn't any team indication on the front of the card. On the back of the card in teeny tiny printing is his team name. The Los Angeles Dodgers. Huh? I never looked past the uniform on Matt. I did a little research and I could not find any information about Matt Merricks being on the Rangers. I saw info on being in the Braves, the Dodgers and the Rockies organizations, but nothing on the Rangers. Well, this time Joey came to the rescue. I e-mailed my findings to Joey. It turns out that Matt Merricks was signed as a free agent by the Rangers in 2006. OK, that makes sense. So the trade was almost completed. I scoured through my boxes and came up with an Ivan Rodriguez 1998 Zenith card to throw in. It's not an insert card, but it's a different kind of card. It reminds me of a thicker Stadium Club card. Nice crisp photography and a very minimal front design. I received the John Danks 2007 Ultra SE auto in the mail on Saturday. I am happy with the card. I hope Joey will be happy with his two cards. Today's game went much better than Friday's game. The Sox found their bats and played like a chip was on their shoulders. The Sox always seem to step it up against the Cubs. Maybe it's from being Chicago's "second team" for so long. I'm not sure how true that actually is, but that's the perception anyway. The Sox hit with authority and pitched well enough to win. It doesn't matter how you do it, as long as you get it done. Nick Massett stepped up his bid for the last reliever spot with a decent performance. The bullpen looked good too. Watching the game on WGN, one thing stuck out in my mind. Kenny Williams should probably stop showing up in the booth. He was a good interview and had some interesting things to say, but the Sox immediately started to lose when he showed up on camera. 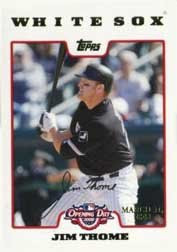 Jim Thome was 2 for 3 with a walk and a home run. Jason Bourgeois had 3 stolen bases. Nick Massett should learn to either throw on target or stick it in his pocket. A lot of Sox regulars went 0 for every at-bat. A win against the Cubs is always a mood elevator. The team seemed to have bounced back from the woeful performance on Friday. The regulars seemed to have shown that the lack of hitting was a fluke, while others still need to step up at the plate. A good game overall. The bullpen is starting to lock down and do well.